Want to get involved in theatre? Do you see yourself as a star on the stage? Do you enjoy helping people? Would you like to work behind the scenes? If so, consider becoming a member of Bundaberg Players Incorporated (BPI). For a small annual fee you receive great benefits over non-members. You don't have to have any theatrical experience to join, if you can hold a paint brush or a broom you can help, if can't don't worry we can teach you. Member's are asked to volunteer their time & participate, in whatever capacity they can, in the maintenance and operation of the theatre facilities. Senior Membership is the most common type of membership and is open for anyone, of any age. 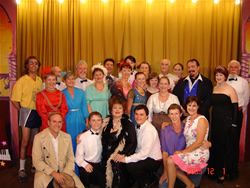 As a Senior Member, you can participate in any performance, in any way, performed by Bundaberg Players Incorporated during your membership year. Senior Members receive one complimentary ticket for each production staged by Bundaberg Players Incorporated (except Theatre Restaurants), a complimentary program, a copy of the newsletter - 'Players Pars' each month, insurance cover at the complex and other great benefits. Senior Membership costs $50.00, or $45 if paid by January 31, and is for a calendar year (1st January to 31st December). If you are interested, PLEASE COME TO THE THEATRE ON SUNDAY MORNINGS - 9AM to 12PM - and we will be happy to show you around! PLEASE NOTE: If you would like to come & watch each production but don't wish to participate in membership duties, you may like to consider becoming an Annual Subscriber. Youth Theatre is open only for persons aged between 10 and 18. Youth Theatre Membership involves workshops being conducted on Wednesday evenings for from February to the Youth Theatre Production mid-year. Registration details for 2019 can be found on the Youth Theatre page. Life Membership cannot be purchased nor is it automatically given, but is awarded to certain members who have shown dedication and loyalty. To be considered for Life Membership, you must have been an active Senior Member for a minimum of ten years and held a position of office. Life Membership is awarded to a member by the committee usually at the Annual General Meeting. Annual Subscription for 2019 is $80.00 per person, or $75 if paid by November, 30, and entitles the subscriber to one ticket for each production on the year's Subscription List, which is a terrific saving. You get the added benefit of being able to book by phone - quote your name and subscription number and your tickets will be held at the Box Office until the day of the performance. Annual Subscribers are not members of Bundaberg Players Incorporated (BPI). To become a subscriber or to renew your subscription for 2019 please complete and sign the form and mail to us, along with payment for the full amount. Payment can be made by Credit Card or cheque - made payable to 'Bundaberg Players Incorporated'. Your application will be processed upon receipt and your Subscriber Card mailed to you (as per the address indicated on the form). Please allow 10 business days for processing.